While the touristy parts of Florida might offer overcrowded beaches and cheesy souvenirs, the more beautiful state parks and recreational areas are your best bets for truly appreciating Florida in all its natural wonder. Both on the Atlantic Ocean and the Gulf Coast are some of the top spots for sand and sun in the world. 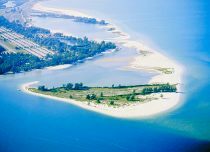 Fort DeSoto Beach (top) near St. Pete, along with Caladesi Island State Park and Cape Florida State Recreation Area in Key Biscayne have consistently ranked as some of the top beaches in the USA. Whether you're looking for ruggedly natural landscapes, beaches that are family-friendly, or a hot singles scene down by the shore, Florida has it all. Of course, this being Florida, you're never too far away from a hotel or a restaurant after a day out in the Florida sun. Have fun -- and don't forget the camera, and the sunscreen! • Wherever you go in Florida, you're never more than 60 miles from the beach. • Although Key West is the most famous, there are more than 800 Florida Keys, spanning more than 180 miles. Key Largo is the longest key measuring 30 miles long and a half-mile wide. • The first suntan lotion was invented by Miami Beach pharmacist Benjamin Green in 1944. He come up with the formula by cooking cocoa butter in a granite coffee pot on his wife's stove and tested each batch on his bald head. The popular product later became known as Coppertone. • Fort Lauderdale was really put on the map as a popular spring break destination following the release of the classic teen movie "Where the Boys Are" in 1960. Daytona Beach Area Official Visitor Information - A good overall resource including what to see and do, dining, lodging, live beach cams, e-cards and screensavers, calendar of events. St. Petersburg-Clearwater - Check out prime beach locations in central Florida with a comprehensive guide to the area's attractions featuring a beach finder, sports and recreation guide, lodging and more. Visiting Lake Placid Florida - Offering 27 clear, freshwater lakes for fishing, swimming and other outdoor summer fun. Check out amenities, event calendar, pictures and driving directions.